When I first started "The Elixir Series" of earrings, I began with a variety of clear glass teardrops in different colors. I offered them wire wrapped in gold first, then, when the response was so great to their release, I decided to make them wire wrapped in silver as well. From there, I became even more inspired. I used to do a good deal of glass etching and sand blasting and I have a good deal of clouding solution left over from this hobby. (It takes quite a bit to do a large mirror or sliding glass door, etc, and the solution can be recycled after use.) So, I decided to do some experimenting with some of my glass beads, and that's how the Frosted Elixirs were born! 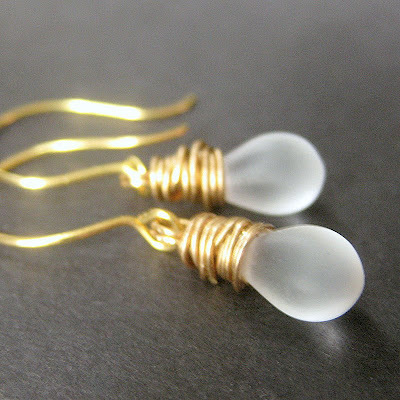 The glass teardrops in these wire wrapped earrings have been hand-dipped in clouding solution to create a frosted glass sheen before being wire wrapped and then set to dangle on delicate matching gold-tone hooks that have been designed by hand for a unique and graceful shape. These 1.2-inch (3.3cm) earrings are made with care to be light-weight on pierced ears and easy to wear and are part of a still-growing series named "The Elixirs". The Elixirs now come in both clear glass as well as in frosted glass (like the pair you see here) as well as in both gold and silver and in a variety of colors of glass teardrops.